Nicholas Richter has been convicted on three counts of sexual abusing some of his former students. A jury returned the verdict after two hours of deliberation Thursday in Richter’s second trial. The first ended in a hung jury. The former teacher worked with gifted students at Ralston’s Seymour Elementary. He was charged with four counts of sexual assault of a child. Prosecutors say he inappropriately touched students over their clothes. The three charges he was convicted of were all Third Degree Sexual Assault of a Child. While Richter’s trial is over, nightmares continue haunting his victims. Court records led us to the home of one family on the witness list. Mom didn’t want to go on camera but tells us her three boys were students of Nicholas Richter. She says one of her sons was being groomed by Richter, though nothing criminal happened. 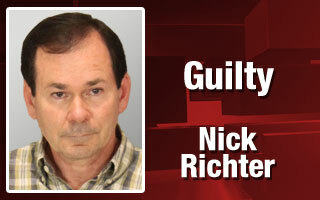 Richter was initially charged about a year-and-a-half ago. He could face up to 15 years behind bars.